Is it possible that MoviePass lied about finances??? We haven’t heard from these guys… in quite a while. And by “these guys” we mean MoviePass, of course. The New York attorney general is investigating the parent company, Helios and Matheson, of MoviePass for possibly having misled investors about company finances. 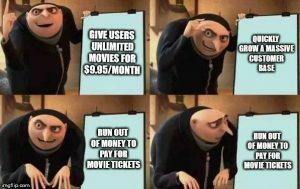 If they were misleading us… they weren’t doing a good job because all we can recall is MoviePass constantly almost running out of money. The company had outages due to cash shortages and continued to see its stock price drop. A far cry from… last October when MoviePass was trading for $39 per share! Today, the stock is trading at 2 cents per share after a 250 to 1 reverse split. Stockholders have also filed two federal class-action complaints against Helios and Matheson stating that the company made “materially false or misleading” statements. Looks like another company is ready to bite the dust..